Rikpa is a key term within Buddhism and in particular within the tradition of the “great perfection” (Tib. dzokchen, San. ati or maha-sandhi). As with any important word, it can have a variety of meanings and nuances depending on the context. 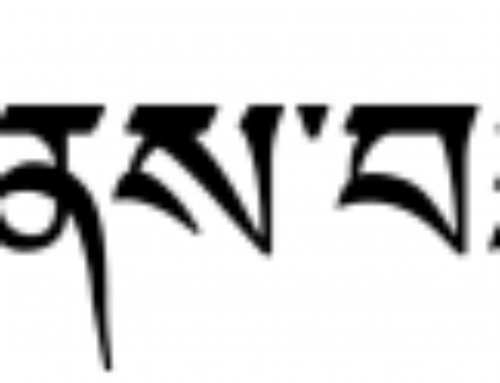 The Tibetan rikpa translates the Sanskrit vidya, which comes from a verbal root meaning “to know, understand, perceive, experience.” It can denote the action of knowing or understanding, with some emphasis on the perceiving or seeing of an object, and so it is weighted toward the perceiver side of the subject-object dynamic. Thus, in common, ordinary usage it can just refer to mind. At the beginning level, this is the practical application of knowledge to the relative world, often through the study of the ten arts and sciences, or rik-ne (rig gnas), which is from the same root. At its highest level, there is no longer any separation between the seeing and the seen, the knowing and the known, the meditator and the object of meditation. Thus, rikpa can refer to the most basic experience of mind and, at the same time, to the highest understanding of mind that the teacher points out to the student—the true nature of mind. One way to begin to understand rikpa is to look at its opposite—ma-rikpa (or avidya in Sanskrit) is un-knowing, not knowing, ignorance at its most basic level. This is not the afflictive emotion of “ignorance” or “delusion” that we often speak of in the context of the three root kleshas of passion, aggression, and delusion (Tib. ti-muk, San. moha). Ma-rikpa is a more fundamental state of ignorance. It is the basic ignoring of space that creates our solidified perception of other. Our ignorance becomes so solid that we lose any reference point outside of our own dense black cloud of un-knowing. We become completely lost in this state from which our painful conditioned existence arises. According to the Buddhist tradition, there are three main aspects of mind, which in Tibetan are called sem, rikpa, and yi. The basic mind, the simple capacity for duality … is sem. Rikpa literally means “intelligence” or “brightness.” In colloquial Tibetan, if you say somebody has rikpa, it means he is a clever, sharp fellow. This sharpness of rikpa is a kind of side function that develops from the basic mind, it is a kind of lawyer’s mentality that everybody develops…. It looks at the problem in every possible way—inside-out and outside-in. Rikpa is an interesting term. The translations we have come up with before have been problematic. We had difficulty translating rikpa in The Rain of Wisdomas well. I’m not particularly trying to make you into translators, as such; but you should know these terms. Rikpa means “insight,” which in this case means that whatever you see is clear. This is the closest to the definition I can come. If you look up insight in the Oxford English Dictionary, or in any other dictionary, it will mean something else. But insight here means that whatever you see is appropriate and precise. Following the Vidyadhara’s view, for many years we translated rikpa as “insight,” with the emphasis on its more active sense of knowing and perceiving. When Dilgo Khyentse Rinpoche composed an ati-style guru yoga for the Vidyadhara (“The Guru Yoga of Dharma Sagara”), we compared our translation of rikpa with other translators of ati texts, many of whom translate this term as “awareness” emphasizing its open, spacious, and expansive nature. At that time we began to adopt this translation in most cases. [noble] family” as the Rigden King is the one who unifies the kingdom and bring all subjects into one vajra family lineage.